I was so looking forward to these, but they didn’t exactly come out right. The cake ended up slightly undercooked, and the frosting was just an all-around mess, setting the second I turned the mixer off. By the time I put the frosting on the spatula, it was already too hard to spread. I ended up going back to the mixer and adding a bit of milk each time I frosted about four cupcakes, just so I could get it temporarily back to spreading consistency. I may try these again, but will definitely add milk while mixing the frosting. Preheat oven to 350F. Line 18 muffin cups (you’ll probably need two trays) with cupcake wrappers. Combine the sugar and butter in a large bowl, and cream together with an elextric mixer until light and fluffy, about 4-5 minutes. Beat in the eggs and egg white, one at a time, followed by the vanilla. Combine flour, baking soda, and salt in a medium bowl and whisk to combine. Add the 1/3 of the flour mixture to the sugar mixture and stir well, followed by 1/2 of the buttermilk. Add in another third of the flour mixture, followed by the rest of the buttermilk and the last of the flour. Stir only until no streaks of flour remain. Divide the batter evenly into the prepared pans, smoothing the surface with a spatula. Bake at 350° for 18-22 minutes or until a wooden toothpick inserted in center comes out clean and the top springs back when lightly pressed. Combine the brown sugar, milk, corn syrup, butter and salt in a medium saucepan. Bring to a boil over medium-high heat, stirring to dissolve sugar. Reduce heat, and simmer for 5-6 minutes. Pour syrup mixture into a large bowl and let stand for about one minute. Add powdered sugar and the vanilla, then beat with a mixer at medium/high speed until smooth. Cool for 2-3 minutes (icing will be thin but thickens as it cools) before frosting, mixing for a few more seconds with the mixer to smooth it out. 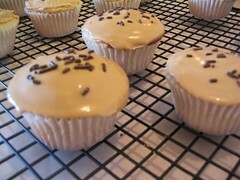 Frost cupcakes and let them stand at room temperature until ready to serve so the frosting can set. When I saw those on Nic’s site originally, I thought the icing looked like it might be difficult to work with. Thanks for sharing your trick! Wow! These cupcakes are popular. Here’s another version you might want to try. Heck, I want to try them (without the nuts).